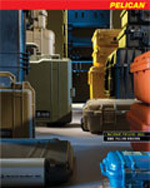 The Pelican 1065 HardBack case is engineered to protect tablet-type computers up to 10 inches. This includes the iPad™, iPad 2 and the Motorola™ Xoom from extreme environments. Weight with foam: 1.25 lbs.